”He changed our tactics and gave us character.” Spartak Moscow captain Denis Glushakov on Massimo Carrera. Spartak Moscow haven’t won the Russian Premier League title since 2001, but they are currently sat five points clear at the top of the table with 40 points from 17 games. Their turnaround in fortunes can be attributed to Italian Coach Massimo Carrera, who has revolutionised ‘The People’s Team’ since taking over the reins back in August. The former assistant succeeded ex-boss Dmitri Alenichev, who resigned following the club’s early elimination from the Europa League at the hands of Cypriot side AEK LarnacaTactically, Carrera is similar to Chelsea boss Antonio Conte, who he previously worked with at Juventus. He shares Conte’s obsession for building the play out from the back, some attacking patterns, and even defensively, he prefers man marking and defending from deeper zones. Not only are Spartak getting results under Carrera, but they are also impressing with their style of play. They are a team with clear ideas, an attacking mentality based on ball possession, and are to some extent a mix between Conte’s and Pep Guardiola’s teams. In terms of formations, Carrera mostly utilises 4-2-3-1, although he sometimes opts for 4-3-3 configuration. ​What follows is an exploration and analysis into the methods of Carrera, and the implementation of his tactics at Spartak Moscow. Spartak start the plays through short passes from the keeper to one of the centre-backs or to the defensive midfielder at the edge of their own penalty area. The full-backs are wide, while the other defensive midfielder is positioned behind the opponent’s first pressing line. Carrera relies on his centre-backs to progress the ball and to spot a good vertical option. Two of Serdar Tasci, Ilya Kutepov or Salvatore Bocchetti split wide in the build-up phase, offering a first option to the goalkeeper. They help progression of the ball through their vertical penetrative passes to the midfield or straight to one of the strikers, and they also advance with the ball through half-spaces if allowed, often when the defensive midfielders are marked. Above: Fernando drops between the two centre-backs when they spread creating a 3v2 during build-up; he also occasionally drops into wide areas to receive. The two defensive midfielders are asymmetrical and have different roles. Fernando is more a holding midfielder who dictates the tempo—the Brazilian’s contribution in build-up and ball circulation is fundamental; he is a sort of complete midfielder with noticeable technical and physical ability (despite only standing at 5’9”). The other midfielder is Glushakov, who is more a box-to-box midfielder sometimes roaming between the lines. This duo has had a huge impact on Carrera’s positional play, not to forget Roman Zobnin, who joins the three-man midfield when they use a 4-3-3. Up front, Zé Luís is similar to Diego Costa. Strong and fast but better with the ball, he drops deep, dragging defenders with him and pulling them out of position to create space for team-mates to exploit. The Cape Verdean striker is also a target for long balls due to his ability in areal duels and winning the second ball. Carrera has developed a fluid and dynamic game that aims to control and stretch the opponent’s lines. Most of Spartak’s movements and variations happen in higher zones; for example, the central midfielders move towards the half-spaces when playing 4-3-3, the wingers sometimes interchange their positions and also drop centrally. Quincy Promes constantly drifts inside, joining Zé Luís as a second striker. Zé Luís and playmaker Ivelin Popov drop frequently, aiming to create an imbalance in the opponent’s defensive shape. Above: The defensive midfielders move laterally, pulling the opponent from central areas and creating passing lanes for defenders to the striker who, as discussed, drops to receive the ball straight from the centre-backs. ​Above: Spartak overload one side, attracting the opponent’s block to the ball’s position, and switch into another area. Above: The full-backs’ diagonal runs into the space behind an opponent’s defensive line are highly effective. Above: Spartak attacking the half-spaces through wingers. Above: Generating a free man and third-man runs. Spartak defend with a mid-block 4-4-2 or 4-4-1-1; even when they play with 4-3-3, Jano Ananindze remains in front with the striker in the first pressing line. Carrera employs an aggressive man-oriented zonal marking system and the three lines are tight and compact vertically, however some small horizontal compactness issues appear on occasion when one of the defensive midfielders follows his man.Spartak do not tend to press the opponent in higher areas, leaving opposition centre-backs to circulate or play sideways passes. Instead, Carrera’s side close off central passing options. Their first line of pressing (performed by the attacking midfielder and striker) isolates the opponent’s defensive midfielder or any central passing option—the ball-near attacker presses the ball-carrier using specific runs to cover passing lanes, while the attacking midfielder marks the opposing defensive midfielder. The aforementioned man-oriented system requires more individual defending skills—every player is responsible for whoever enters his zone, following and tracking them until they are out of their zone. As a result, the centre-backs leave the back line and follow the opposing striker when he drops, the wide players stick with their men wherever they go, the wingers mark the full-backs, and the full-backs mark and follow the opponent’s wingers. Generally, Carrera’s game is not special with transitions. 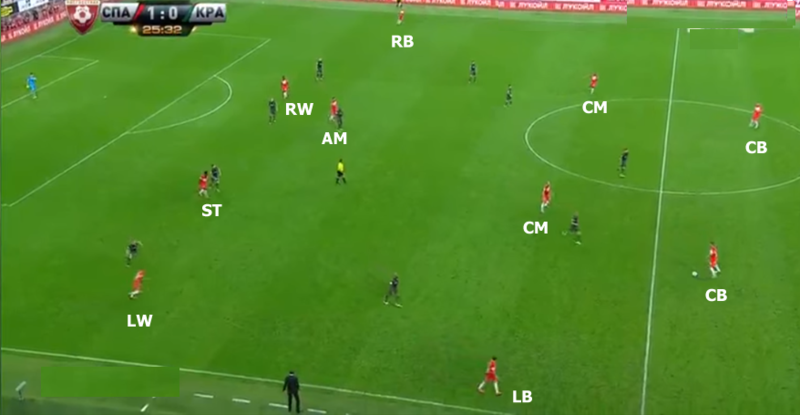 However, in defensive transition, Spartak are willing to press in higher areas. Even though they have a good structure, they do not counter-press collectively, rather the ball-near players apply immediate pressure and close down near options while the rest recover the defensive shape. Spartak haven’t been favourites for the title, which would make victory even more sensational. With Carrera’s winning mentality and tactics, supporters of Russian football’s sleeping giant can dream of a long-awaited championship. Posted in Tactical and tagged Massimo Carrera, Spartak Moscow, Tactical. Bookmark the permalink.